0398 - Best days of my life - Heroes Inc.Heroes Inc.
I’m sure this will have no effect on the space-time continuum. Regarding the above, I apologize for resorting to such tactics, but web hosting isn’t cheap. This entry was posted in Action, Story and tagged Guardia, Link. Bookmark the permalink. Paradox get! 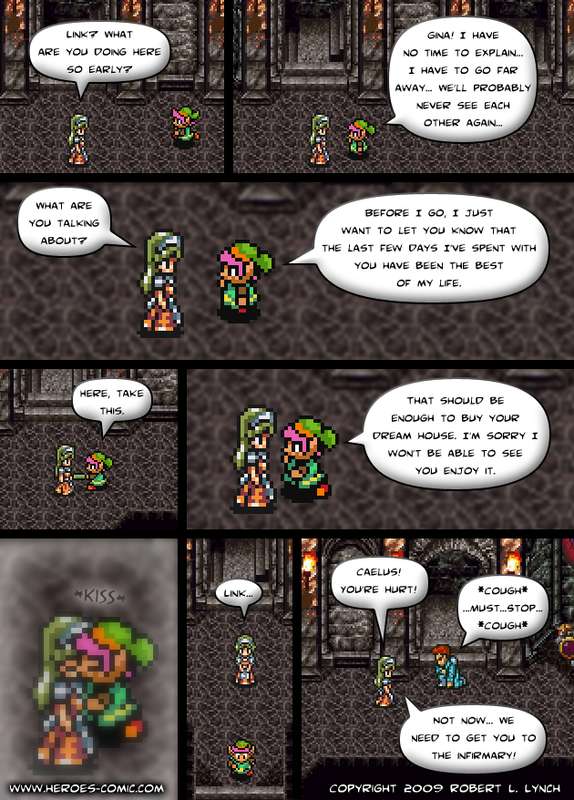 Since Gina fell for Link, she won’t fall for Caelus (who was injured by Link either way) which means Crono will start fading from existence! Oh noes! Or so I think anyways. I tend to be woefully wrong for this kind of thing. Didn’t you see Back to the Future ? She will have a Nightingale complex and fall in love with her patient, as Marty’s mother was supposed before Marty became the patient itself. And, well, we all know that our talks about that are plain nonsense : the course of events will obviously the most ironic one (remember that in every fiction ever, the three most powerful entities are #3 Any deities of the fiction universe, #2 The author, #1 The irony (a.k.a. Murphy’s Law)). Heh heh, can’t wait for the next one ! But the idea that time is unchangeable is a theory, just as the theory that it can change. We don’t know who’s right. So it could change things. If i was any author of any plost storyline that I allowed comments on, I would make sure I would put up what is least expected for the biggest affect. and he’ll be like “YEah” And then he’ll give him the hades gate!